Here in California, my family is a frequent visitor of a supermarket chain called 99 Ranch. For years, we actually mistakenly called it Ranch 99, but I digress. Two years ago, back when I was still in high school, I remember passing by a display in the grocery store for mochiko. I had heard of mochiko before, but I had never actually cooked with it. I managed to convince my mother to buy a box of the unknown substance under the pretense that it would be part of an amazing creation. In reality, I had no idea what to do with my new purchase. I knew that I could probably make mochi, but I was hoping to make something less obvious. 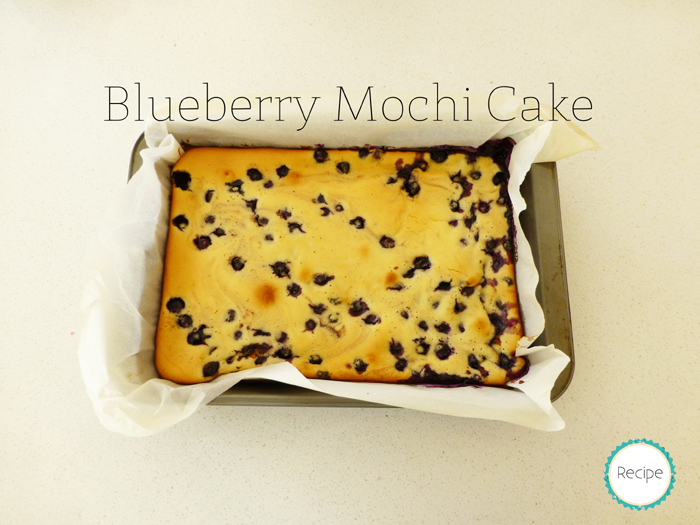 When I finally came across this recipe for a blueberry mochi cake, I was absolutely thrilled. Now, every time I go back home during breaks from school, my mom will ask me to made a batch or two of this mochi cake for her to freeze and munch on while I’m gone. They don’t last very long, though. The great thing about this recipe is that you really don’t have to measure much of anything. It requires one full box of mochiko and one full can of evaporated milk. The cake is very chewy. Some people may not like this type of texture, because it’s very dense, but I know that my family loves it. Also, this cake will probably only keep in the refrigerator for about five days, so quickly freeze leftovers if you know that you are not going to eat them right away. 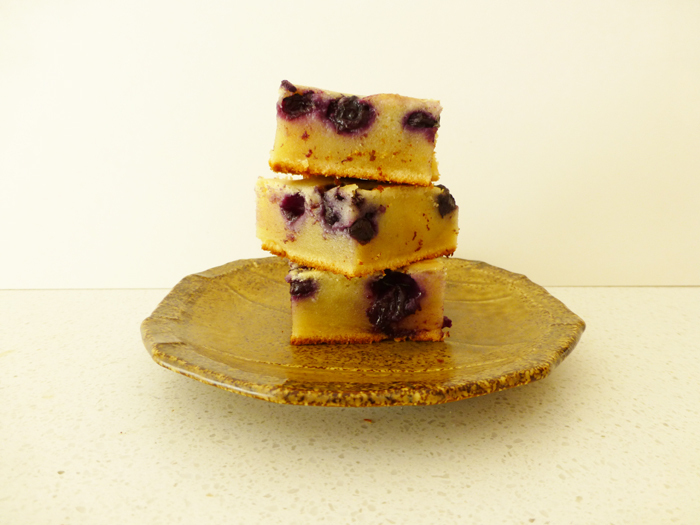 I also made a few modifications to the recipe: I used frozen blueberries, substituted vegetable oil for the butter, and also cut back on some of the sugar. I felt that there were no real differences; you may even want to cut down the sugar more if you don’t particularly like sweet things. 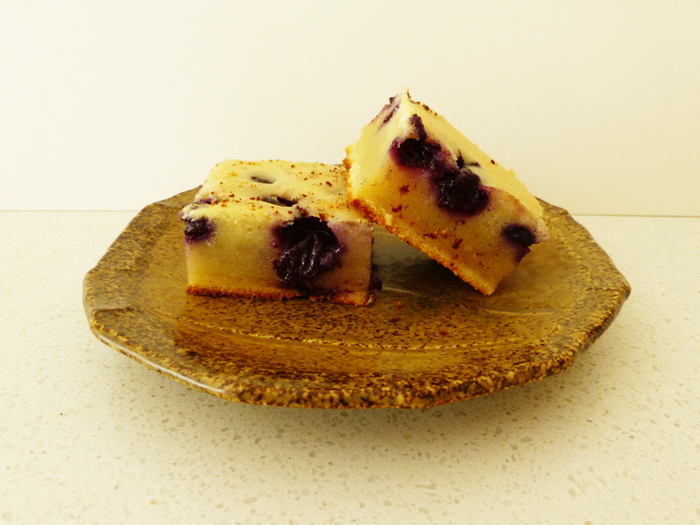 The frozen blueberries may bleed a bit more, but I liked how there were streaks of juice running through the cake. It’s also important to make sure that the batter is smooth and lump-free before baking or else you may get a fine, grainy texture in your cake. Mix in the evaporated milk to the butter/sugar mixture. Mix eggs into the mixture. Mix in the rice flour, baking powder and vanilla. Make sure that there are no lumps. Fold in the blueberries gently with a spatula. Pour mixture into a parchment-lined 9 x 13 inch pan. Bake for approximately 50 minutes at 350 degrees Fahrenheit. Let cake completely cool, allowing the cake to set, before cutting and serving.